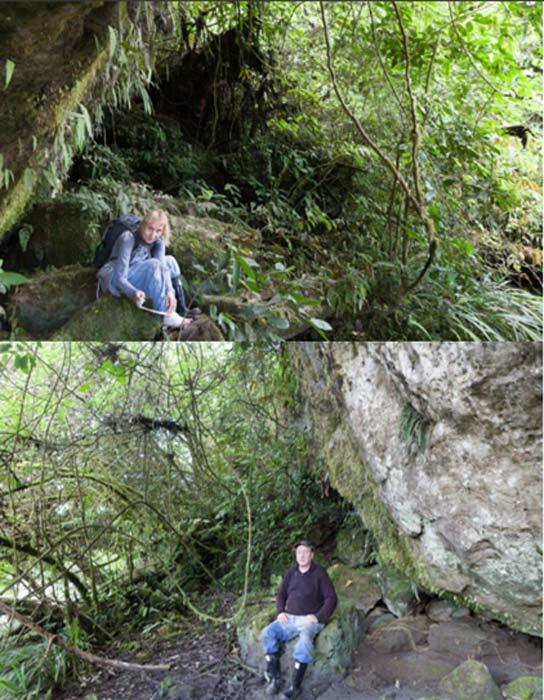 After building trust with a local Shuar village, Ancient Origins returned once again to explore the Tayos caves in Ecuador. While the search for hidden cave entrances continues, our recent expedition also demonstrated that the secrets of the area may go beyond the caves and tales of Father Crespi and his mysterious treasures. The journey to the village where our host Luis lives near the Pastaza River is not an easy one – but it sure is exciting for those who crave the adventure that accompanies steep, slippery slopes, a “bridge of danger” (a thin tree trunk and another piece of wood placed beside it), and outcroppings of jagged rocks in the Amazonian jungle. Our small group was comprised of Ancient Origins’ team members John and Alicia, and archaeology enthusiasts and AO Premium members Wendi and Scott. We arrived to the village with a few bumps and bruises, but altogether ready to begin the search for cave entrances and whatever else may arise. Scott, John and Wendi break from hiking to snap a photo in the rainforest. The community welcomed us warmly and were glad to have new visitors. As we prepared our simple rooms we were provided with some papaya from their garden. We conversed over dinner about past and future guests before heading down to the river to do some stargazing. As the fog rolled in we returned to the dark lodging house where a cold bucket shower awaited those who felt the humidity was already having its affect. Part of the jungle not far from the village. 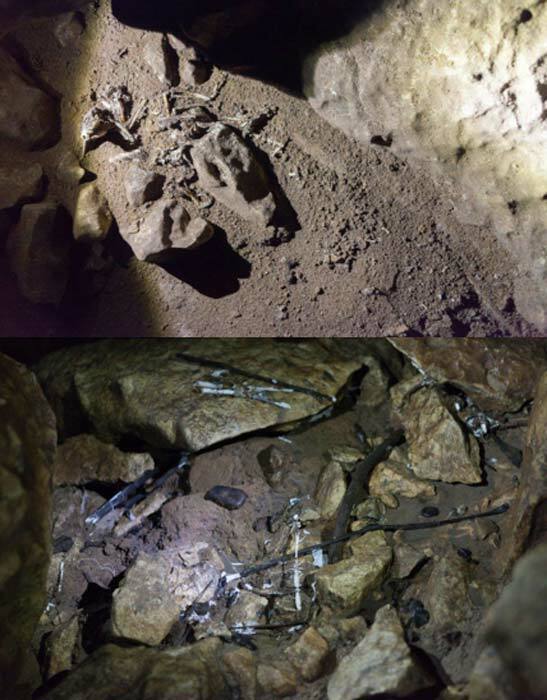 We soon learned that we were not the only beings in that lodging – bats and a snake made their appearance known that night and over the next few days. 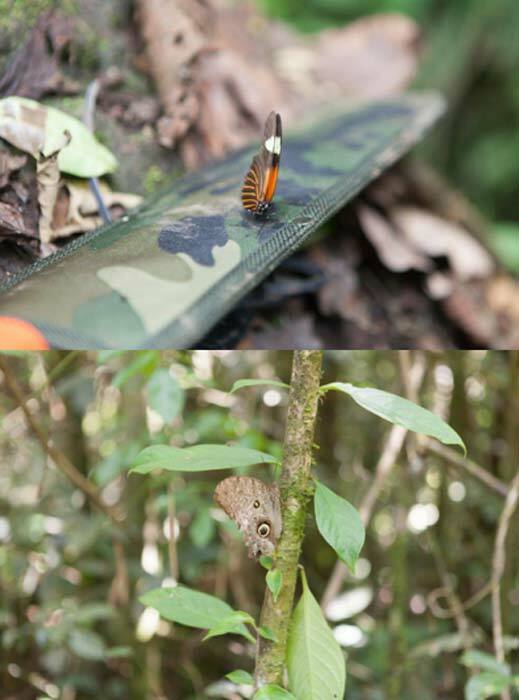 Butterflies: Examples of two of the more benign creatures we encountered on our expedition. We were served a hearty breakfast in preparation for what was to be a very long day. At 8:30am we set out with a spring in our step. Unfortunately, shortly after we had passed some slim paths we were attacked by powerful wasps which could pierce our clothing and hold on even when we tried to shake and swat them off. That experience left most of us with some big red welts for the rest of the expedition. We weren’t going to let that unlucky experience stop us though! Our first planned stop was to visit one of the cave entrances found during the last expedition. After repelling in, John informed us that it was unpassable once inside. John in one of the cave entrances. So, we set off along the beach towards another set of tunnels which were partially explored last time. When we had conquered the slippery mud on the way in, we were met by an endless series of angry bats and birds. Lucky for us they only swooped down and crossed our path. 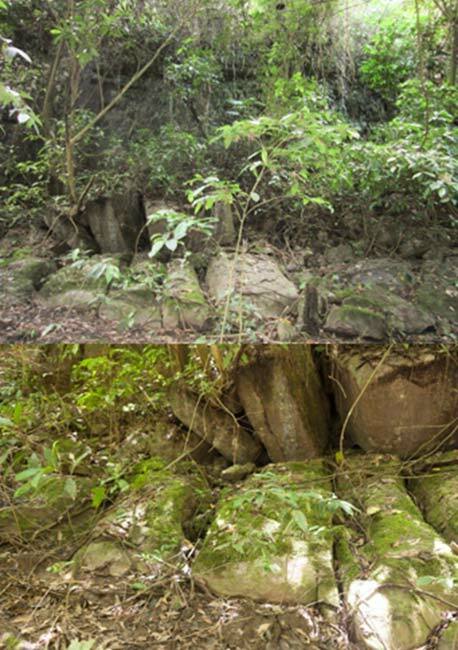 The screeching of the distressed animals may provide some explanation for why the Shuar people believed that spirits could be found within the cave and would not continue to search those tunnels after a certain point. We waded (and sometimes swam) through varied levels of cool waters and eventually reached a place that was seemingly unpassable – at least at first glance. Scott braved the cliffs and entered what we soon called “the Scott Path” a small area that was near the roof of the cave and involved very careful footwork to cross jagged rocks. Scott and Wendi in a cave. After hours of numerous slips, falls, scrapes and bruises, we eventually reached the end of this cave. No treasure or traces of it were found within. We did, however, find evidence of possible stone tools amongst an assemblage of soft black rocks. Apart from this, we noticed a strange white substance with gold droplets on some pieces of twig-like objects as well. Up from one black rock and white substance grouping we found the skeleton of a bird. 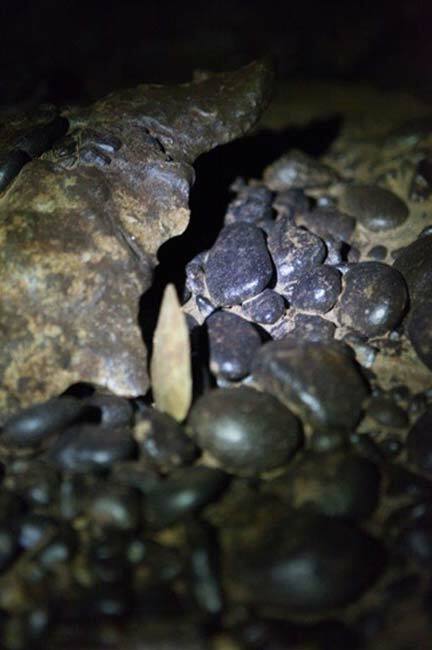 Three possible stone tools and one of the soft black rocks found in one of the caves. The assemblage of rocks with one of the possible stone scrapers. The bird skeleton found above a collection of the white substance and twig-like objects. On our way out, another surprise was waiting to be found– a snake peeked out at us from a crevice just behind where we gingerly stepped into the cool waters. The serpent let us be, and we made haste towards the end of that section. Scott and Wendi in the water in one of the caves. As we passed one section of the cave we noticed a passage above us that could have held a small room. John scaled the slippery rocks and set off inside to check things out as we flashed a light from another side to see if it was a real room or just a short passage. The light was seen and John prepared to make his descent…only to find that the way he had climbed up was not so easy to return down. Scott was ready to help once again and offered to guide John’ feet back down the wall. Unlucky for him, the seemingly secure footing he used to raise himself up a little higher was not what it appeared. As the rock ledge he was standing on broke away, Scott fell down onto his back into the middle of the passage! This was probably the only time he was happy to be carrying the large and padded backpack! Wendi tending to a hurt foot and Scott taking a well-deserved break out of the caves. Despite the increasing numbers of cuts, scrapes, bumps, and bruises, the team kept their spirits up and continued our search for interesting sites on the long trek back to our lodging. 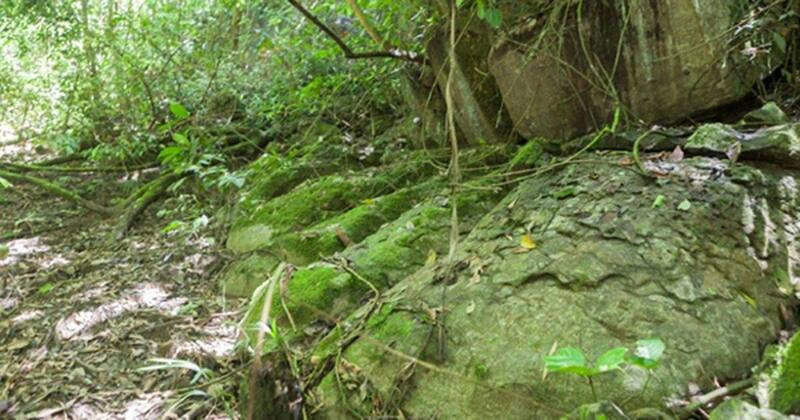 We were rewarded for our curiosity with a mysterious rock structure that ran along a large section of land near the river. However, we had to leave it behind for at least one night, as 6pm and the quick falling darkness was on its way. 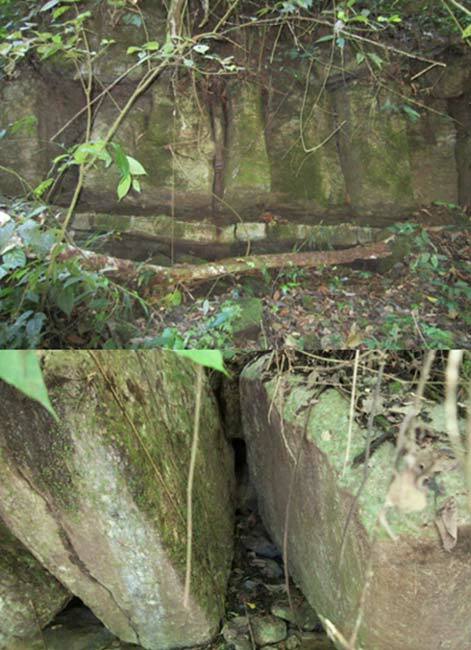 General view and detail of the large rock structure we encountered on the expedition. We found a way to pass the still active wasp hive and headed straight for the rock structure that called our attention the afternoon before. 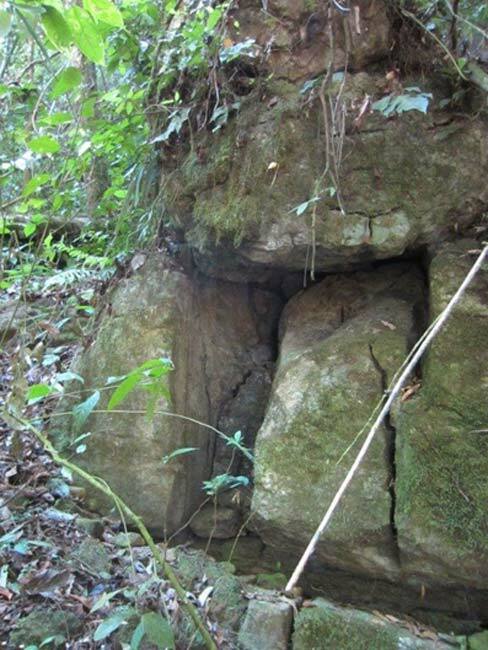 There we searched the area in front of the rocks and noted the appearance of “toes” at the foot of the structure. But the rocks could not be our focus that day and after a quick survey of the area we continued to search for cave entrances. Wendi and Scott examining the rock formation. “Toes” seen at the base of the rock structure. The sun had come out in full force, so we were ready for a swim by the time we reached some calmer waters along the river. As some of us cooled ourselves in the cool water, Wendi set off over a smaller “rock wall” and explored the area nearby. She found a possible cave entrance under some trees and called the rest of the team over to investigate. The smaller “rock wall” near the calmer waters of the river. We all searched the difficult terrain for more cave entrances, and the result of that afternoon’s work was at least five possible entrances in a relatively small area. However, the hot sun and physical stressors began to take its toll on the team and we had to return to camp a little earlier that day. Walking over the rocks near the river. The rock structure called our attention once more and we decided to spend some more time examining it. However, we could not find any entrances that we could get through or any clear archaeological material suggesting its purpose or creation. Thus, the team split in two groups and hacked our way through the brush to climb up and over the apparent “wall” of giant rocks, but we still found no entrance or concrete evidence that the large stones had been placed intentionally. Without other tools, we were unable to see past or under the large stones. So, their origins remain uncertain. 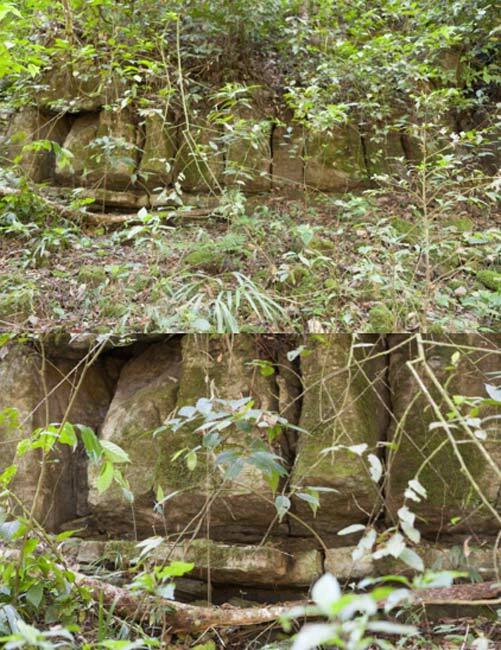 Photos of the strange rock structure. Next, we went in the search of the source of a stream we had crossed the day before. The river had risen quite a lot over the last few days and we saw clear clues of the impending rainy season. The team climbed and slashed our way through brush up towards the white rock face that stood far above the river. We experienced some serious rock climbing that day. We made our way up a steep slope of rock with natural hand and footholds and found another series of entrances. Unfortunately, all the openings proved to be impenetrable and one sharp rock inside provided a deep cut into a team member’s hand. Pausing for a break on the way up the hill. Following our descent, one of the team members took ill and another suffered a fall on the rocky river edge. We returned to our lodging where we mended ourselves more thoroughly with the medkits and tried to rest our aching bodies on the lightly cushioned beds. Later that evening nature helped soothe us as it revealed its beauty once again – this time in the form of a blanket of stars. On our final morning in the Tayos village we awakened to see that the clear night we marveled at just so recently had turned into a rather foreboding morning sky. Our departure for Cuenca was planned for 7:30am and, despite the increasing clouds and more frequent rain drops, we said our goodbyes to the village. Some of our hosts were kind enough to accompany and aid us as we inched our way up the steep hill, through the mud, past the (now slippery) “bridge of danger”, and pressed on through the rain up towards the road. Perhaps unsurprisingly, by the time we reached the top about an hour later the clouds had cleared and a warm sun welcomed us once again. The team on the way back to Cuenca. New Tayos cave entrances are still awaiting exploration and the nearby rock structure continues to beckon with its mystery. What secrets does this fascinating region still hold and when will they be revealed? Our time in the Tayos village and caves was an experience no one will forget. The following are reflections written by Wendi and Scott on what they’ve taken away from this expedition with Ancient Origins. Anyone who knows me knows my life began with a love for archaeology. Many trips planned have been thwarted by political unrest or personal tragedy throughout my 63 years of experiences. Finally, this trip with John and Alicia of Ancient Origins fulfilled all my years of wondering and waiting for the opportunity. The Ancient Origins expedition whet my appetite for many more such adventures. All images are the copyright of Ancient Origins . Top Image: “Toes” seen at the base of the strange rock structure found on the expedition. Did you bring mosquito rappellent? Go invest seriously into that radar tech ! That will Not be a waste ! Thanks..